A romance of history and art, Chanderi is a small quaint town on the sides of the river Betwa (Madhya Pradesh). It’s exhilarating past and natural surroundings are a picturesque setting to the crafts they share with the world. Historical monuments mark this valley and these surrounding hills with fervor, boasting of a culturally rich past. It is the birthplace of the fabric that millions across the world admire – the Chanderi fabric. As the morning dawns, the narrow alleys come alive with the sound of the looms. Through every door and window, the moving threads and wooden frames confirm that the time old tradition of weaving has been kept alive. The Chanderi fabric made of cotton or silk or both is known for its sheer quality, transparency, and the exquisite zari work. Today, Chanderi has a burgeoning domestic and international market. An opulent combination of gold and off-white, this gorgeous saree looks regal and is sure to gather some decent eyeballs. You should probably gift this to your mother because she will absolutely love this stunning piece in vintage grey will intricate motifs in gold. 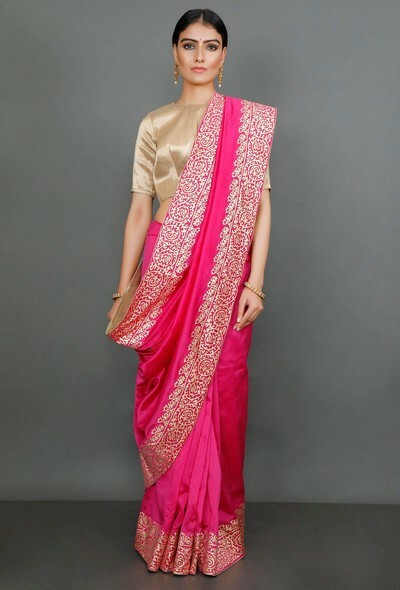 This saree in the yummy sugar pink color is subtle, sophisticated and attractive at the same time. For those who want to outshine and love vibrant colors, this saree in the color fuchsia is a perfect match.